Hyperpigmentation, uneven skin tone, sun spots, age spots – there are many ways to describe dark patches of skin. But how to fight them? Oriflame asked Skin Care Expert Melina Galeadi! 1. What are dark spots? 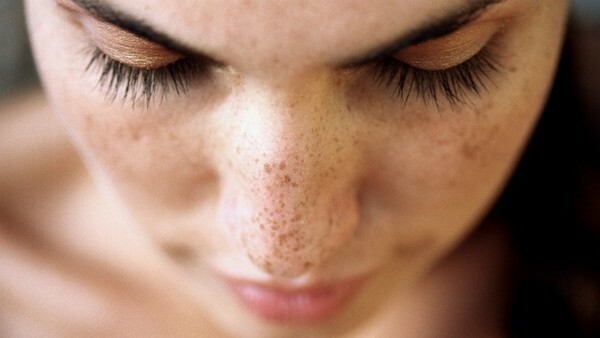 Dark spots are caused by the irregular production of melanin in the skin. The spots range from light brown to black, and have the same texture as the rest of the skin. They do not cause pain and usually arise in areas of skin exposed to the sun. 2. How do dark spots appear? Melanin, a pigment present in the skin, is the natural way the skin protects itself from UV radiation. When exposed to sunlight, melanocytes in the lower layer of the epidermis produce melanin and release it through cells called dendrites into the upper layer of the skin. Melanin absorbs sunlight and causes UV radiation to penetrate the skin. When the skin is no longer exposed to sunlight, melanin recedes. Whenever this mechanism is activated, a small amount is left behind, and over time, these small amounts accumulate and create a stain. It’s like writing with a pencil on a piece of paper, erasing it, and repeating it several times. Eventually, a stain will appear. In addition, this mechanism becomes less effective over time, which also results in the accumulation of melanin in a specific zone. It also has a cumulative effect, which means that damage done in adolescence will impact later! There are different causes that trigger this process. The main culprit is sun exposure, however hormonal imbalance, such as experienced during pregnancy, can also trigger this process. In addition, different people have a greater or lesser melanin synthesis, so the effect differs from person to person. 3. What can I do to prevent or reduce dark spots? The most effective way to prevent discoloration is to reduce sun exposure. Over time, sun exposure results in uneven skin tone and accelerates skin aging. Thus, it is crucial to use FPS – especially in areas exposed to the sun, where year-round use is recommended. Exfoliation with a product containing BHA or AHA acids also helps to improve the appearance of the skin and give a more even skin tone as it promotes cell renewal. 4. Can face care products help? For UV protection, I recommend the Advanced NovAge SPF 50 Day Cream . This cream imparts the highest level of UVA protection to protect skin from UV rays and aging skin. In addition, it protects the skin from some of the negative effects of the environment and is intensely moisturizing. The Bright Sublime NovAge line, which includes patented Multi-Bright technology that addresses all key phases of melanin production to correct and prevent skin discoloration. It is clinically proven that Day Cream and Bright Sublime Serum (tested together) minimize dark spots up to 50% and lighten the skin up to 40%. 5. How to prevent the appearance of dark spots in the future? Avoid sun exposure by using sunscreen products that correct skin tone, and exfoliate twice a week to promote a more even skin tone. Invest in quality products that act on this condition and always take care of your skin. In addition to the FPS, wear sunglasses when you’re outdoors!